Special chemicals covering the skin of a tiny yellow-striped Amazonian frog provide a protective shield that wards off leaf-cutting ants allowing it to live comfortably among them. "It helps the frog blend in, because it imitates the ants own chemical signals," says André Barros of the National Institute of Amazonian Research in Brazil. He led a study in Springer's journal Behavioral Ecology and Sociobiology. The ants do not give it even a single bite, but will quite aggressively attack all other types of frogs or other animals that cross their path. This type of chemical-based mimicry and camouflage is often used by parasitic invertebrates and allows them to live unhindered within the protective confines of social insect-colonies. However, the strategy is not often seen in vertebrates, much less among frogs, and is only known in two other African frog species. Lithodytes lineatus is a South American frog that is mainly found in the Amazon region. In Spanish the frog is known as "Sapito Listado". It shelters, breeds and builds its nest peacefully in the midst of leaf-cutting ants of the genus Atta without ever being attacked by them. Leaf-cutting ants use chemical odors, such as pheromones, to recognize and communicate with members of their colony. Barros' team therefore speculated that the skin of Lithodytes lineatus must also be covered with a similar type of chemical that makes leaf-cutting ants recognize them as "friendly" and cheats them into allowing the frog into their midst. They ran two sets of field experiments to test this. First Lithodytes lineatus frogs and four similar species were held in a glass vessel for ten minutes along with leaf-cutting ants. 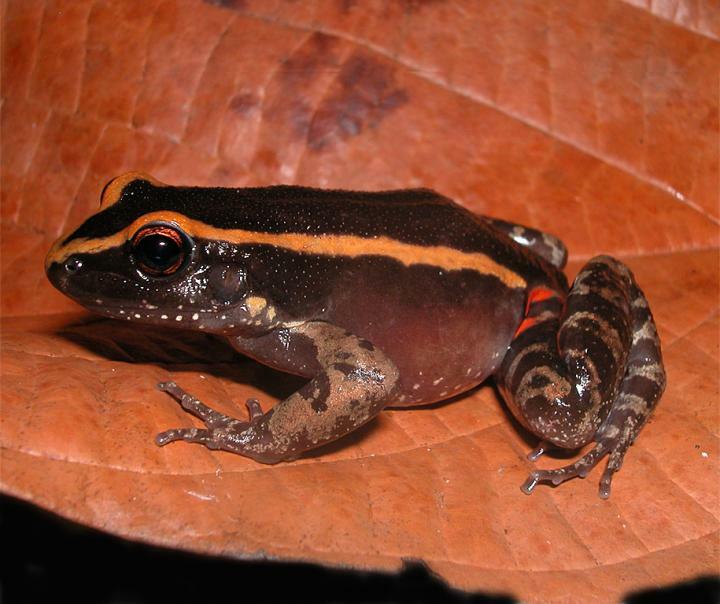 The Lithodytes lineatus frogs made no escape plans, in contrast with the members of the four other species that tried to jump or climb out and that were attacked by the ants. The researchers then watched what happened when they covered 20 Rhinella major frogs that are common in the Amazon region with either the skin extract of Lithodytes lineatus or with ultrapure water. The skin extract protected the 10 frogs that were covered with it and that were placed within the nests, while the rest was attacked by the ants. "Our results demonstrate that the skin of frog Lithodytes lineatus has chemicals that prevent the attack of two species of leaf-cutting ants," says Barros. "It therefore seems that Lithodytes lineatus has chemical skin compounds that are recognized by ants of genus Atta, which may allow for coexistence between ants and frogs." Barros speculates that one of the advantages of this living arrangement is that the anthills provide a stable microclimate and higher humidity, which is important for the reproduction of frogs and the development of their eggs.